Petunia and Poppy came to our farm at just 8 weeks old. They were adopted from someone with a farm who had several piglets that they needed to find another home for. Petunia and Poppy are sisters from the same litter but have different personalities. Petunia is a little more brave and outgoing while Poppy is a little more hesitant and shy. They both adore grapes and have quickly learned how to sit for a grape. We are beginning their harness training and so they can continue being socialized to become ambassadors for rescued pigs. Both pigs were spayed at 6 months old and have lovely even temperaments with no signs of aggression. Mini pigs come in a variety of shapes, colors, patterns, and sizes. They are considered full grown at 5 years old. A large percentage of their growth occurs between 1 and 5 years old. Mini pigs should be expected to grow to 15 inches + and 60 lbs +. Any breeder promising lower heights or weights is setting up unrealistic expectations. Labels such as teacup, micro, micro mini, extreme micro, nano, and pixie are misleading marketing terms. These are not descriptions of size or breeds of pig. Many pigs sold are sold under these misleading terms and once the novelty wears off and th owners discover their pig is indeed, A PIG and not a toy, the pig is abandoned or sent to a rescue organization who often have a hard time rehoming them. 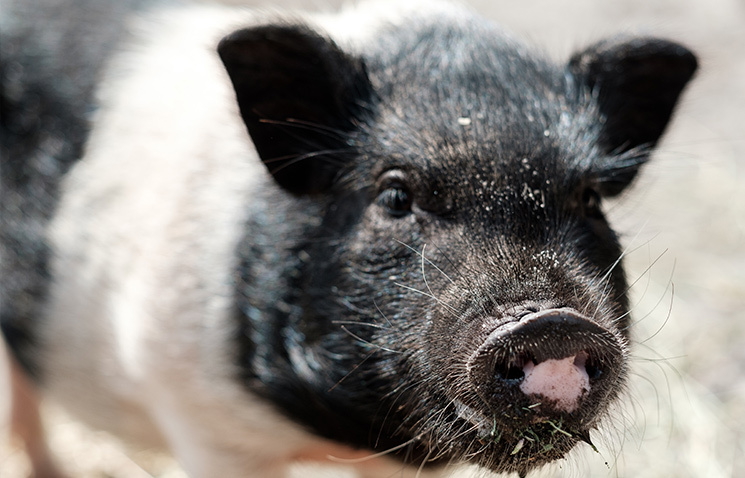 If you are interested in owning a pot-bellied pig it is important that you research the care involved and consider adopting a spayed or neutered pig from a reputable pig rescue. Pot Bellied pigs can live for 12-18 years on average, however some have been know to live for 20 years. 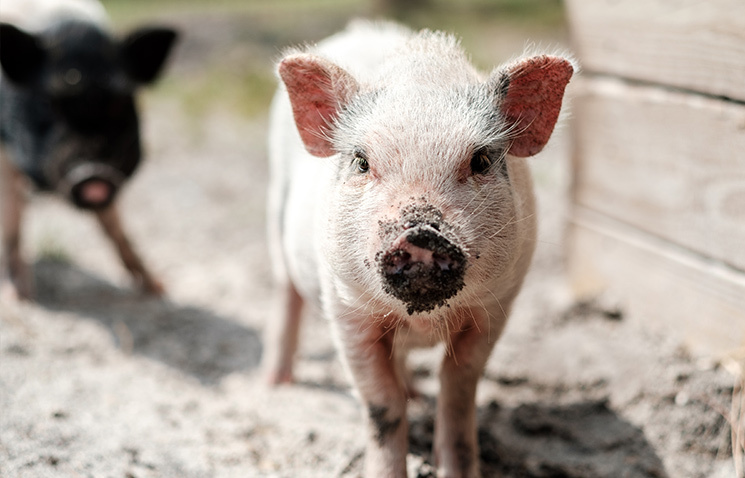 It is important that their lifespan be taken into consideration when choosing to own a pot-bellied pig since they have very specific housing and care needs. It is also important to check zoning laws in your city or neighborhood as many areas and HOA’s do not permit Pot-bellied pigs as pets. Pigs are very intelligent and are ranked as the 5th most intelligent animal (man, monkeys, dolphins, whales and pigs). They function by instinct, intuition and memory. They learn quickly and don’t forget what they master. They can be trained to do tricks, walk on a leash, be housebroken and even learn pig agility. Their intelligence also means that they are curious, can be escape artists and are easily bored which can lead to destructive habits. Pig owners must always be aware whom is training whom. Pigs are highly social animals animals by nature. In their natural environment they live in groups with defined social orders. Pigs require attention and positive social interactions. Due to their social needs it is best to have two pigs so that they always have a companion. Pigs communicate vocally and through their body language. Squealing can indicate displeasure, pain or excitement for food; Grunting is most common when a mother feeds her young or while piglets are eating; Barking warns of danger; Ouffs indicate contentment and are soft. A happy pig seldom displays body postures as those are generally reserved for maintaining position within the herd. However, a spoiled, challenged or disgruntled pig will display many postures including: jaw clicking, head swiping, charging, or changing ear set. Pigs have poor eye-sight but extremely keen sense of smell. It has been reported that pigs can even smell something 25 feet underground! In addition to their excellent sense of smell pigs also have excellent hearing. Pigs are most known for their appetite and can be unrelenting in their search for food. They can become aggressive with children who may have food, can learn to open refrigerators to help themselves to food, will overturn items searching for food or root up the ground or gardens. While they have a seemingly unrelenting appetite it is important that pig owners manage their calorie consumption as many pigs can develop severe health issues due to being overweight. Yes, there is such a thing as an overweight and obese pig. While pigs can be affectionate their natural instinct drives them to want to be the head pig. As a pig owner you need to make sure your pig understands that humans are at the top of the pecking order and that your pig respects this. Pigs who are not trained and socialized properly can exhibit a form of aggression known as dominance aggression. Spaying or Neutering your pig at an early age is also important to ensure that their hormones don’t also play a role in their temperament. Pigs respond well to positive reinforcement (i.e using praise and treats when the pig is doing something desirable) and do not do well at all with lots of physical punishment. Consistent rules, praise for good behavior, and correction/redirection with lots of repetition and patience will help produce a well-mannered pot bellied pig with a good relationship with humans. Many exotic vets have specific requirements for age/weight before they will spay (female) or neuter (male) a pig. Generally 8-12 weeks is the recommended window for spaying or neutering. With female pigs it is especially important to spay them when they are young because as a female pig matures she develops more fat in her abdomen, making the surgery more difficult. American Mini Pig Association is a membership organization with a variety of online educational resources for pig owners and those considering pig ownership. American Mini Pig Rescue advocates is an online resource connecting pig rescues with adopters. Esther the wonder pig was famously sold as a micro pig until her owners discovered she was really a 650 pound commercial size pig. This led to them changing their entire life and moving to a farm to start the Happily Ever Esther Farm Sanctuary. The Swimming Pigs is a popular instagram account for the famous swimming pigs in the Bahamas. Don’t miss out on the latest happenings down on the farm! Subscribe to our newsletter. © 2019 Weisberg Stables. All rights reserved.